I hung onto the giant parasol to stop it flipping over and Mum made sure the fruits of our 12 hour stint in the kitchen were all safely under cover as the rain lashed down and gale force winds swept through the Covent Garden piazza. Bottles from one stall came crashing down and talk of closing the market had us panicking about what we'd do with all the stock. Then, as if nothing had happened, the wind dropped, rain stopped and the sun came out to dry our red and white bunting and bring out the punters. All in a day's work for a market stall trader... But we are no ordinary stall holders. No siree! Don't get me wrong, me and mum both have plenty experience of baking for the masses and mum has done a million and one 'big cake sales' for charity, but nothing of quite this magnitude. A stall in the local church hall is one thing. 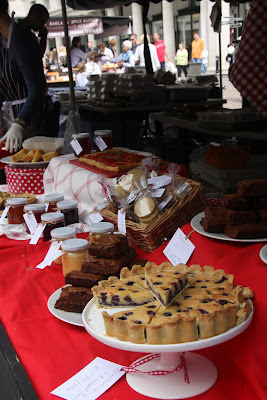 A full day selling our homemade cakes, tarts and jams at Covent Garden is another. I guess what we were out to achieve was that (usually uncoveted) 'one hit wonder' status (OK, maybe we had some idyllic pipe dream that this could be a rosy future...!). For us, this was a couple of days off from our day jobs to do what we love best - cook - to sell the fruits of our hard work and, in the process, learn about the 'selling side', have some fun and meet a few people. 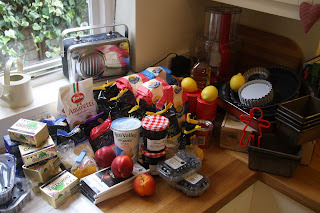 Not long after I started blogging I joined the UK Food Bloggers Association (UKFBA) - a place for UK food bloggers to connect with each other. Sometime in the Spring when Julia Parsons, who founded UKFBA, first mentioned the UKFBA stall on Covent Garden Real Food Market there was talk of nominating our favourite producers to man the stall every Thursday throughout the summer. 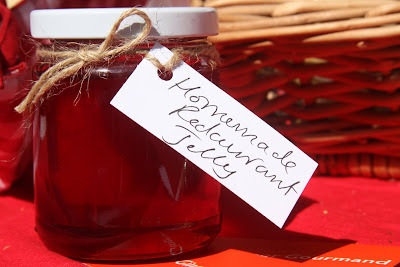 This was soon given short shrift as my fellow food bloggers came forward with plans to sell their own homemade wares - lavender & honey bread, chutney, lemon curd, tamarind ketchup, keema lollipops, carrot cake, Irish soda bread, jams, muffins in all shapes and sizes, tarts, quiches and brownies galore! I have to admit that I hesitated to sign up. Much as I liked the idea, I work full time - how would I find time, could I do all that on my own and (above all) who would calculate the amount of change due (not me, that's for sure...!). It was only when I mentioned it in passing to Mum when we were cooking up a feast for Dad's 60th in May that the idea of taking the stall one Thursday became reality. As many of the other bloggers who have done a stint on the stall will undoubtedly agree, it's so much easier with two! The Covent Garden Real Food Market is a weekly market that runs every Thursday through the summer. For the most part, the stall holders seem to have stalls on other markets in London, like Borough Market. There's a nice feel to the market which I am sure would be much livelier on a sunny Summer's day... In fact when I popped down to see Rejina (Gastrogeek) and Signe (Scandilicious) a couple of weeks' ago the sun was shining and people were swarming around the market. What a difference a touch of sunshine (and two charming and beautiful bloggers-come-market-traders) can make! The best part of it all for me was the full day spent cooking away at our own pace in my kitchen, preparing the lemon drizzle cakes, carrot cakes with cream cheese topping, blueberry and almond tart, leek and gruyere tartlets, redcurrant jelly, peach and amaretto muffins, pecan tarts, stem ginger biscuits, lemon curd, tomato and goat's cheese puff pastry tart, white chocolate and raspberry muffins, traditional all butter shortbread, apricot and vanilla jam and our best sellers...chocolate brownies. The big day itself was undoubtedly hard work. The rush to set up and get everything laid out and labelled up got the adrenaline going though and that saw us through the best part of the afternoon and helped us weather the storms. 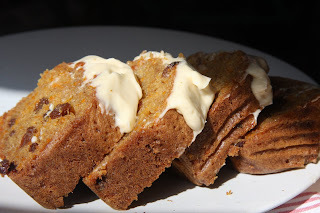 It was great to meet all the wonderful people who popped down to say hello and the compliments, including the one from the lovely American woman who came back especially to tell us that our carrot cake was the best carrot cake she had ever eaten (and, she assured us, she had eaten a lot! ), made us feel pretty good. But as the day drew to a close and the temperature dropped we were certainly ready to sit down, have a beer and reflect on an intense couple of days' work (oh, and flog a few more jars of jam in the pub and then at our post-market dinner at Ganapati in Peckham!). I did say never again when my feet where aching the next day....but I can just see our lovely homemade mincemeat, jams, gingerbread and Christmas puddings going down a treat on the Christmas Real Food Market! I found myself with one such little tub full of egg whites last weekend after our bake-a-thon for the UKFBA stall. Determined not to waste them I called Mum (who needs recipe books when your mum is but a telephone call away...). Her advice was 2oz caster sugar for each egg white, a capful of white wine vinegar, a tea spoon of cornflour (which I didn't have), beat the egg whites until stiff and then beat in the sugar a spoonful at a time until glossy. Armed with these pearls of wisdom I set to work making plain meringues and (inspired by my recently purchased Ottolenghi cook book) some blackberry swirl meringues to use up some blackberries which were lurking in the back of the fridge. 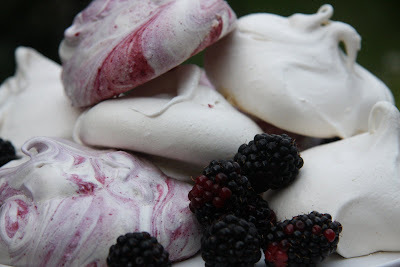 When I posted my photos on flickr last week, @goodshoeday who writes the blog With Knife and Fork asked me what the secret to good meringues was. Like me, she'd never managed to make perfect meringues like you see piled high in Ottolenghis. Jubilant from my recent success I promised to blog about them. I'm not saying they will be just as good next time. But for once, I made meringues I could be proud of so here's what I did. Let me know if they work for you! Set your oven on low - around 100C (I set my fan oven at 90C). Unless you're Popeye after a good dose of spinach, the best way to make meringues is with an electric hand whisk or the balloon whisk on your mixer. Whisk the egg whites until they form stiff peaks. Then, with the mixer still running, add the sugar a spoonful at a time, making sure it's fully mixed before adding the next spoonful. Eventually the egg and sugar mixture will turn thick and glossy. Add the white wine vinegar and the cornflour and mix thoroughly. Grease and line a baking sheet with baking parchment. Put big serving spoonfuls of the meringue mixture on the baking sheet and bake for at least 1 and 1/2 hours, until the meringue is crispy and cooked through. Make some blackberry coulis by blitzing a handful of blackberries with a tablespoon of caster sugar. Pass the coulis through a fine sieve to remove the seeds. 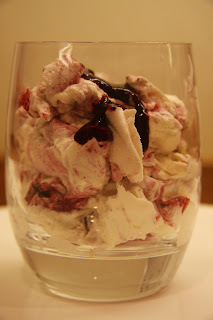 Take half of the meringue mixture above and add a large spoonful of the blackberry coulis. Don't stir it in or you'll just end up with purple meringues! You only need to give the mixture one stir with the spoon so that the meringue mixture has that 'raspberry ripple ice cream' effect. Cook in the same way as the plain meringues, although they may need a little longer because of the extra liquid. 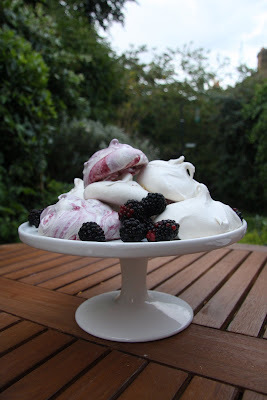 We ate the leftover meringues in a blackberry eton mess - whipped double cream, broken up meringue, leftover blackberry coulis and fresh blackberries. It's not a pretty dessert but it tastes damn fine! Alas, we were pipped at the post in the Viewers' Choice Award by the lovely Helen and Lizzie - the Go Go Gin Girls. Huge congratulations to them! 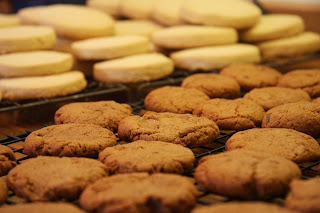 Combine the shortbread ingredients until the just come together. Roll out to 1/2cm thickness and cut into rounds using a 8cm straight edged cutter. Carefully lift the rounds onto a greased baking sheet using a palette knife. Bake at 180C for approximately 15 minutes until they are a pale golden brown. Leave to cool on the baking sheet and then transfer to a cooling rack. Mix the cream cheese, lemon zest and juice, lime zest and juice and sugar. Whip the double cream and stir it into the cream cheese mixture. Cover and chill for at least 30 minutes. 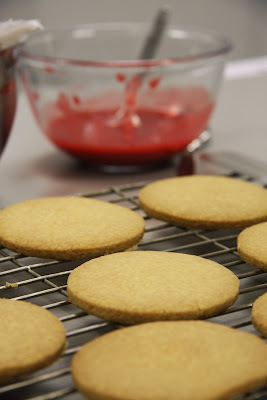 Make the raspberry coulis by blending the raspberries and sugar together using a stick blender and then pass the puree through a fine seive to leave a smooth coulis. Put to one side and prepare your summer berries - leave the raspberries whole and slice the strawberries. 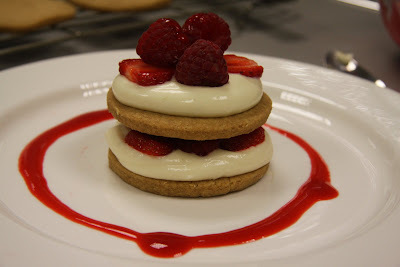 To build the dessert put a tiny blob of the cream cheese mixture in the centre of each plate and place a shortbread round on top. Then add a good tablespoonful of the cream cheese mixture, some summer berries and a teaspoon of the coulis. Repeat with another shortbread round, cream cheese mixture and summer berries. Finish with a swirl of raspberry coulis around the plate. It's a lovely dessert for a summer's evening with friends because you can make each element in advance (even the day before) and then just layer up the desserts at the last minute. Enjoy!